Put water, spices, salt, onion and chicken into a large cooking pot and allow to cook , uncovered, at medium heat for 1 ½ hours, until chicken meat falls away from the bone. Skim away any foam that rises to the surface of the water while chickens are cooking. 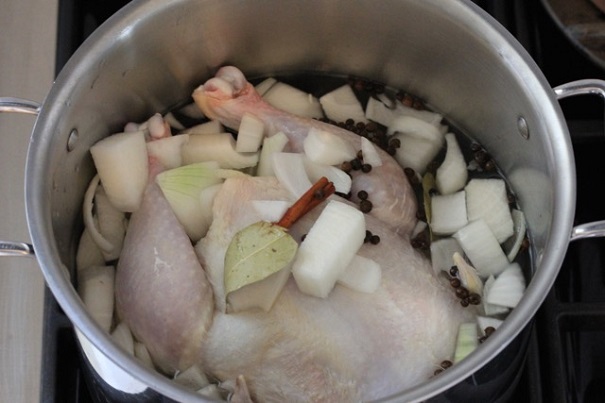 Remove chickens from the broth (retaining broth), and take chicken off the bones in healthy chunks. Reserve chicken to serve on top of the stuffed rice. 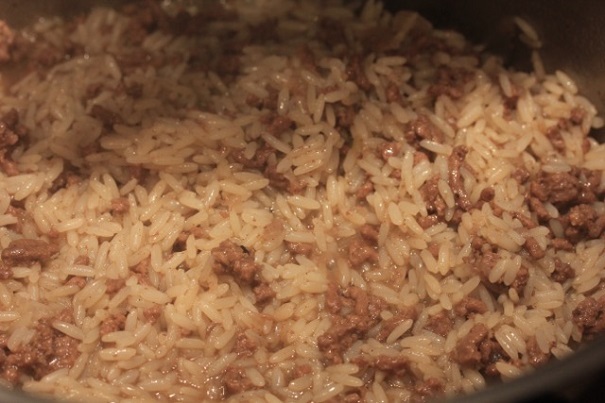 Allow mixture to get to a low boil, cover, and cook until water is absorbed into rice. While the rice is cooking, pour 1 tablespoon oil into a frying pan and toast almonds until golden brown. Remove from pan and allow to drain on a paper towel. 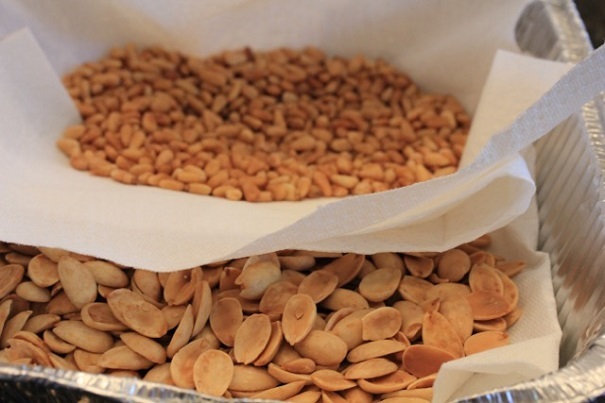 Repeat process with pine nuts: put 1 tablespoon oil into frying pan and toast pine nuts until golden. 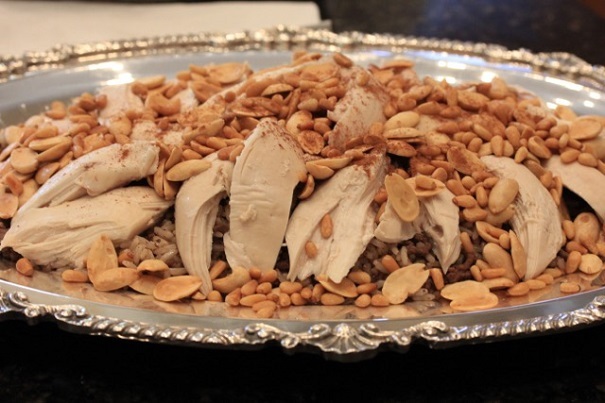 Drain on a paper towel and set both almonds and pine nuts aside until serving. 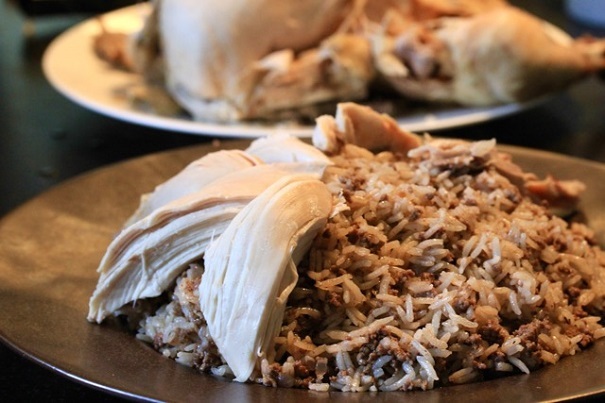 When rice is cooked through, mound on a platter, and place chunks of chicken on top. 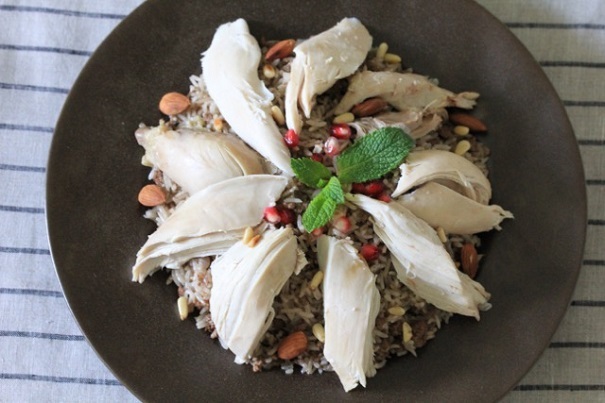 Garnish with toasted almonds and pine nuts, and serve. Add to the remaining water from the chicken: 1 teaspoon cornstarch (to thicken), 1 chicken bouillon cube and 1 teaspoon of lemon juice. Stir in ¼ teaspoons of cinnamon, allspice and pepper, and heat, whisking until sauce is smooth. Serve on the side with the chicken and rice.